The idea just kind of came to me out of nowhere as I was walking pass my fridge. So let’s get cooking! 1. Heat up a frying pan at high temperature until you can feel the heat emitting from the pan when your hand is about 6 inches above it. 2. Pour a small amount of olive oil onto the hot pan and spread it evenly over the entire pan. 3. 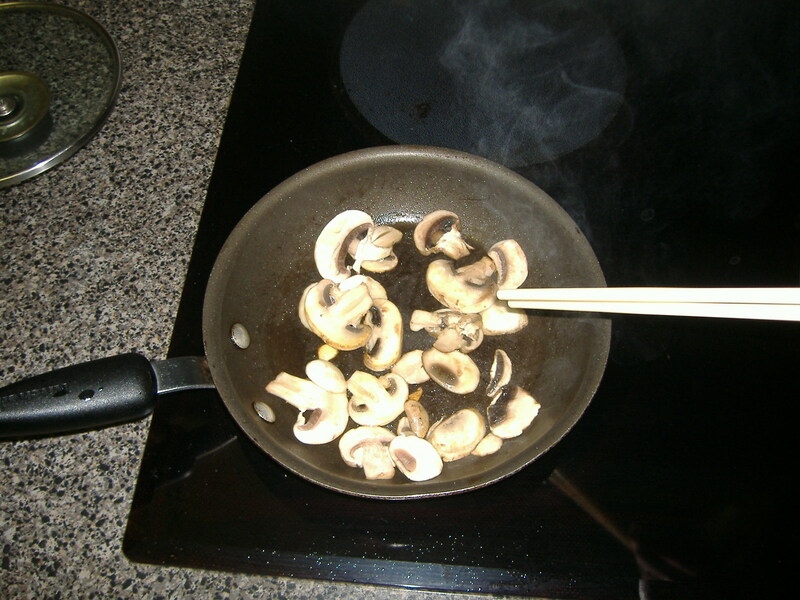 Saute mushrooms at MEDIUM heat until they are golden brown. This should take a minute at most, the longer you leave the mushrooms on the pan, the more moisture it will lose and the smaller they will get. Raw mushrooms just throw on the frying pan. 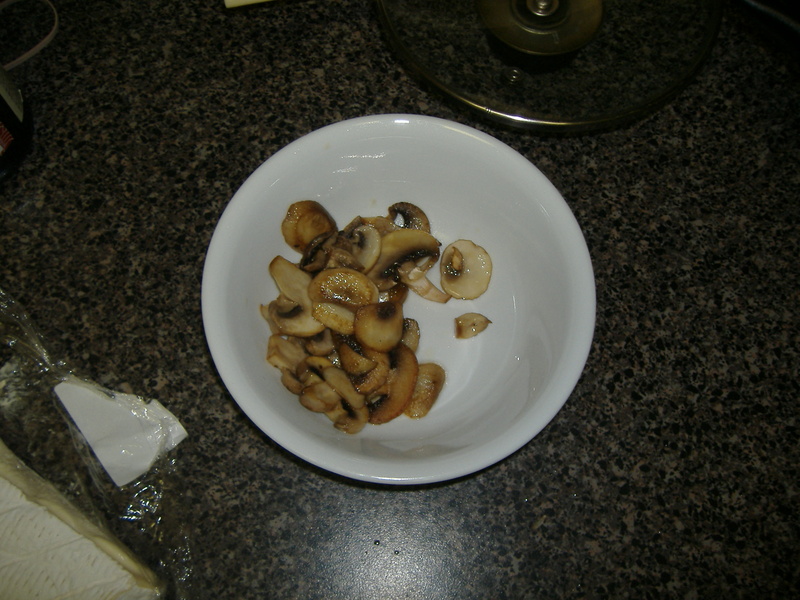 Saute mushrooms until golden brown. 4. 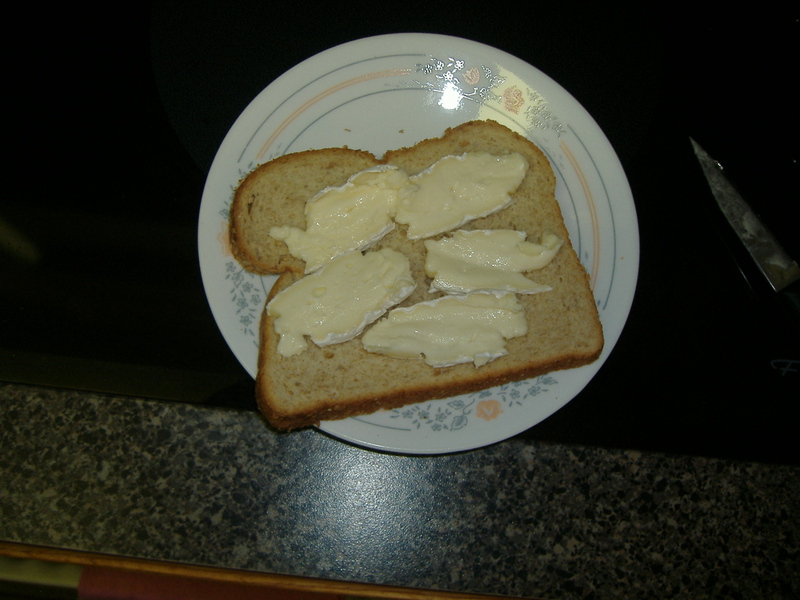 Cut thin slices of brie cheese and lay them out on a piece of bread. Arrange the slices so they cover the piece of bread. 5. On LOW heat, warm up both sides of each slice of bread (without the brie on them). On one piece, spread the brie cheese out on top and warm until the cheese is soft. 6. 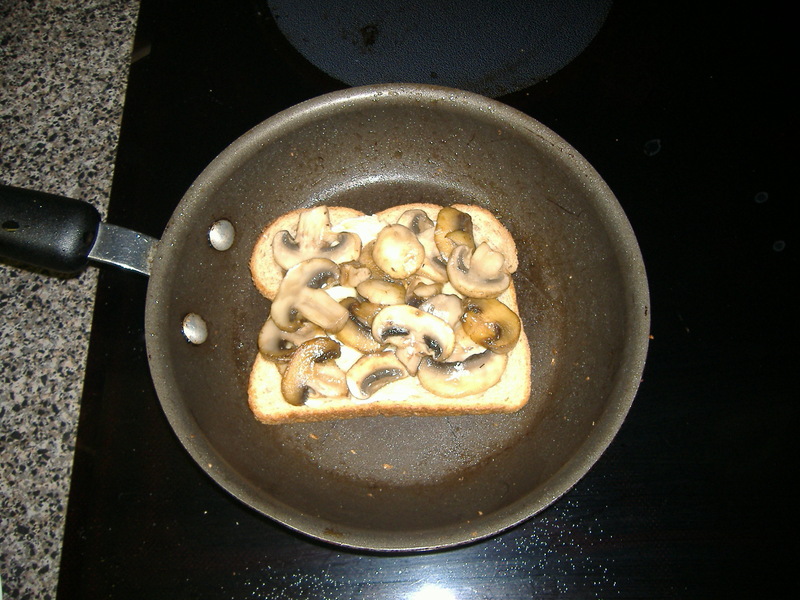 Spread the sauteed mushrooms on top of the cheese evenly. Warm for several minutes. Spread the mushrooms out evenly. 7. Evenly place the tandoori chicken on top and then put the other piece of bread on top. Evenly place the chicken on top. 8. 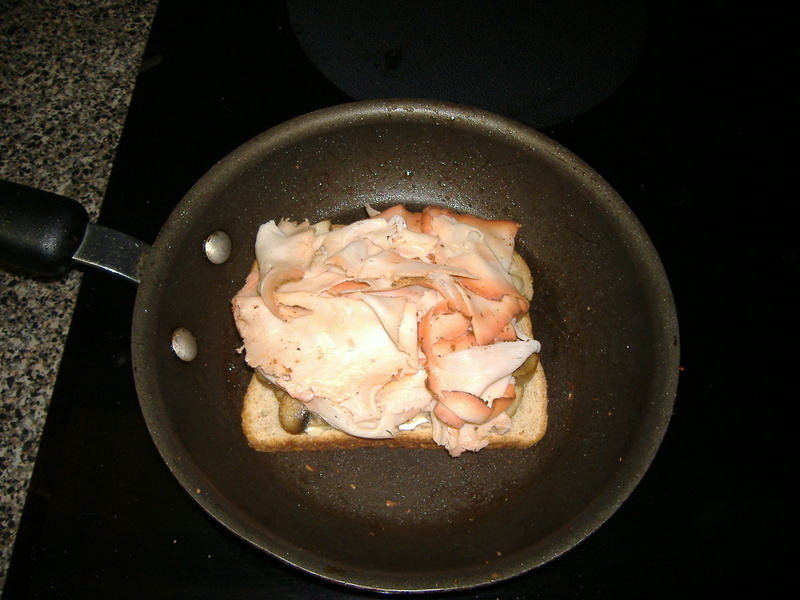 Flip the sandwich over and heat for several more minutes. 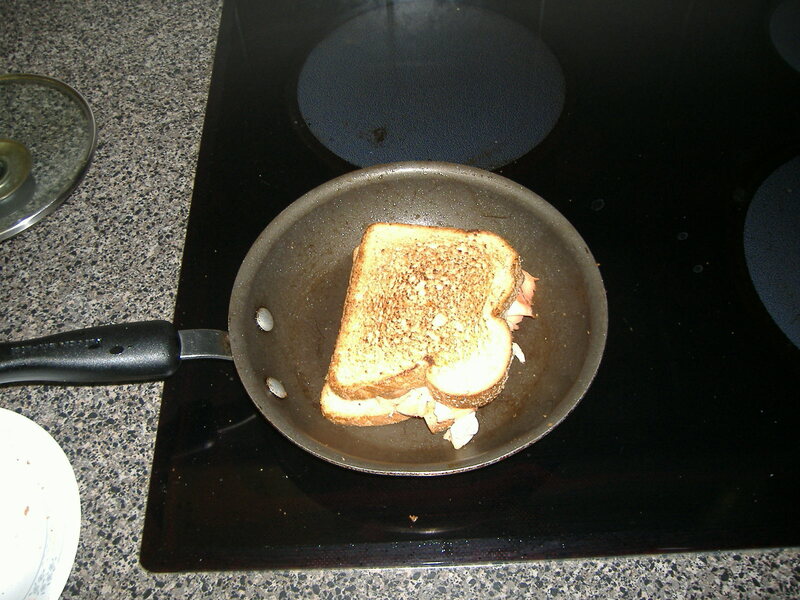 Flip the sandwich over and heat the other side. Make sure you’re controlling the heat properly. I cannot stress this enough. You can easily burn the bread of the temperature is too high; by using a lower heat setting, you can allow the heat to transfer without burning the surface touching the pan. Notice that the sandwich I made has brown toasted piece of bread. 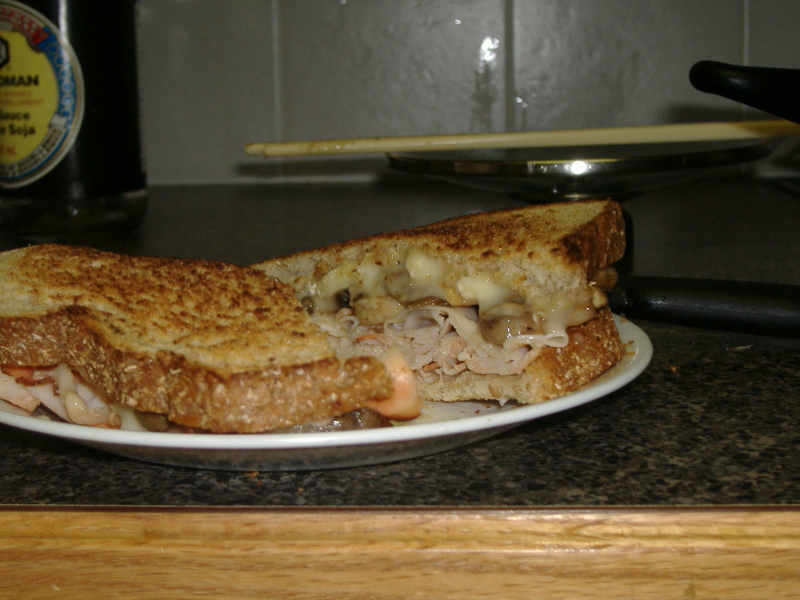 Evenly spreading out the cheese, meat and mushrooms will ensure that the sandwich heats evenly. I thought the end results was very tasty; the tandoori chicken and brie cheese complement each other very well. However, I had trouble tasting the mushroom; the chicken seemed to overpower the taste of the mushrooms. The bread was had a nice crunchy texture but wasn’t overly dry, chicken was moist and the brie was creamy. 4 Responses to "Sandwich Experiment!" Looks very tasty! Good job Smash :D! I’ll give that garlic thing a try next time Az. What a yummy and interesting blog you have! Sound slike your creative juices are hard at work. I wish I could pass my refrigerator and think the same thing. 🙂 I hope you are planning to post the results of your sandwich experiment.